What is an Oh Sh¡t Jacket, you say? Typically reserved for more extreme alpine pursuits, like frolicking in hail storms and blizzards, the Oh Sh¡t Jacket is typically heavier, completely waterproof with some sort of Gore-Tex material, and not something that any self-respecting runner would ever carry due to its weight. As trail running gear, especially jackets, get extremely ultralight (and sheer for some reason), they’ve lost their ability to provide protection from the elements outside of a bit of chilly wind. While these ultralight jackets certainly have their place in mildly bad conditions, they also look outstanding pasted and sheer onto your soaked torso when you’ve decided you should’ve brought something a bit heavier. Enter the Ultimate Direction Ultra Jacket V2 ($190) and Ultra Pant V2 ($120). These are the first products I’ve used that are truly waterproof and windproof for very cold and wet temperatures while still feeling and moving like a running rain jacket and pants. That is, they perform like the Oh Sh¡t Jacket but otherwise move and act like something you’d want to run in and stow in a hydration pack. 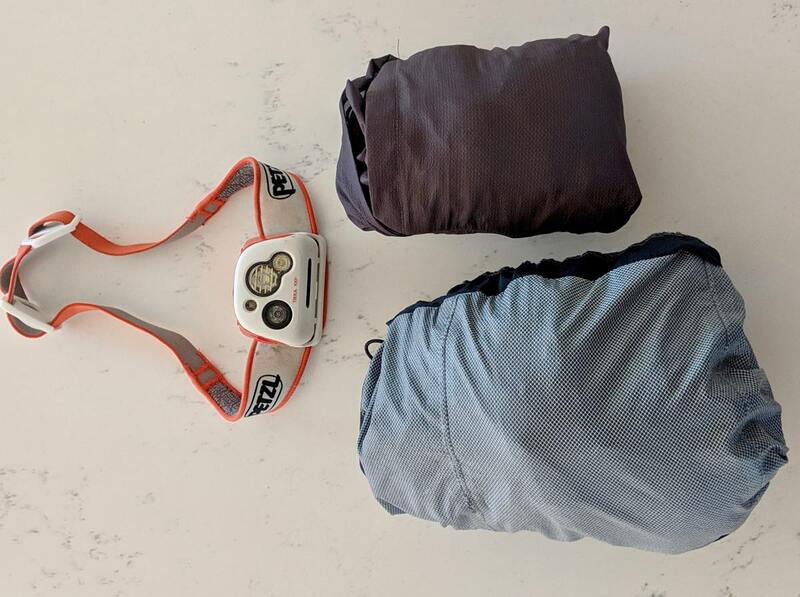 Weighing in at 6.1 ounces for men and 5.6 ounces for women, the Ultimate Direction Ultra Jacket V2 doesn’t feel much more robust in your pack than an ultralight shell, but the protection is way more substantial. 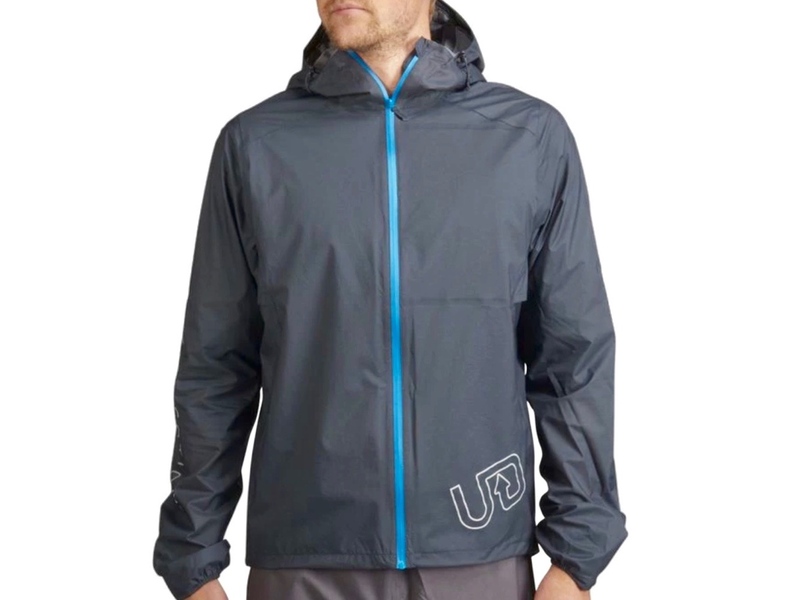 With this second version, Ultimate Direction adds an improved cinching system around the hood and a zipper cover that comes right up to the chin and does not rub, which is a problem I’ve had with almost every other hooded rain jacket. Additionally, a pliable visor really functions to keep the rain out of your face and this is a jacket I can comfortably cocoon into during a downpour and not have rain seep in. The hood also offers some mesh venting at the back of the head behind a protective lip, which does help with airflow. The tech specs of this jacket state that it’s made from 10D high-strength 2.5L nylon. The idea with waterproofing versus breathability in any jacket is for large water molecules to stay out while letting sweat-vapor moisture from your body out. When a running jacket is two layers (2L), it usually consists of a durable water repellent (DWR) coating applied to nylon. In a 2.5L jacket, you get the light flexibility of a hyper-light 2L shell with some additional printed or sprayed-on coating for additional weather protection. The Ultra Jacket V2 has a 30,000 mm water entry pressure and 30,000 mm vapor transmission rate, both of which exceed the waterproofing and breathability standards for UTMB mandatory kit. Ultimate Direction adds some nifty mittens for added hand warmth that are easily tucked into the jacket cuffs when not needed. Unfortunately, they do not accommodate the thumbs, and for those of us with cold hands, these little mitts don’t do too much. Venting is also added underneath the arms and an internal pocket, accessed only by unzipping the jacket, does fit plus-size smartphones and keeps things dry. At 5’10” and 155 pounds with narrow shoulders, a men’s small felt just right for me. I have heard grumblings that this jacket is a bit more form fitting than the original Ultra Jacket. The length of this jacket basically comes right past the waistband. 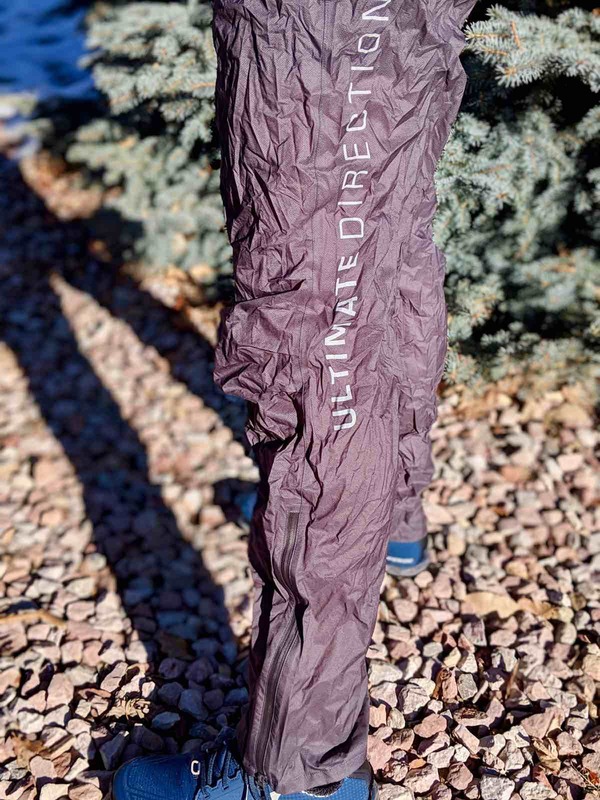 The Ultimate Direction Ultra Pant V2 is a simple, comfortable-to-run-in, and highly protective pant. It weighs in at 3.5 ounces in both the men’s and women’s models, and is made of the same 10D high-strength 2.5L nylon material as the jacket. I loved the leg zips that allowed me to slip these on and off over shoes, as well as the running-pant-like fit, which has significantly less ‘swishing’ than in rain pants from other brands. The Ultra Pant V2 can be worn over shorts in significantly colder conditions than any other rain pant I’ve tried. 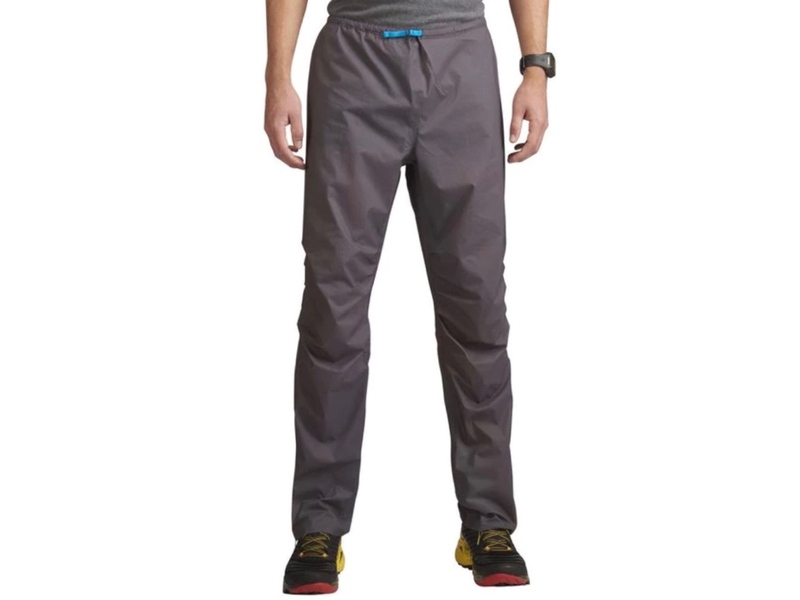 Compared to the second-best running rain pant on the market, the Patagonia Houdini Pant, the Ultra Pant V2 is more comfortable, more protective, and feels much more durable. The Ultra Pant V2 packs in itself via an inconspicuous pocket tucked in the waistband, and this pocket can be used to carry a couple of gels. There is also a minimal and flexible drawcord incorporated into the waistband that stays in place when you cinch to your preference. In the Ultra Pant V2, a men’s medium fits me well. 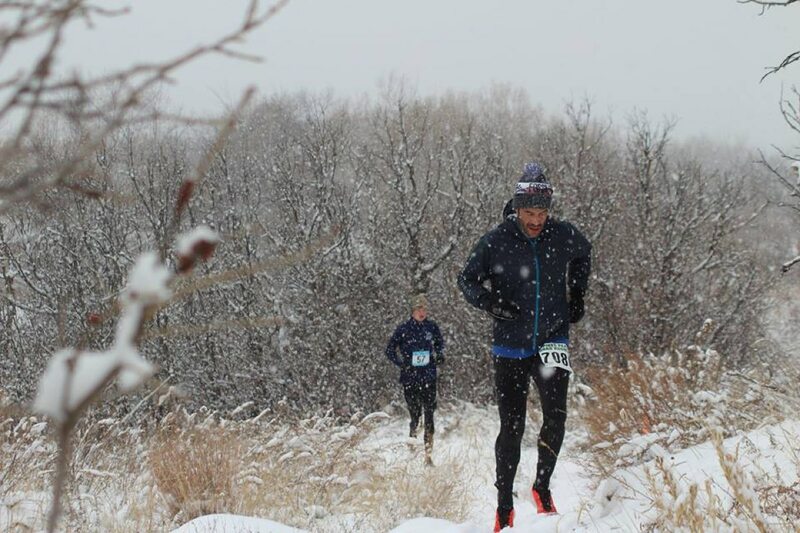 Dressing for the weather is completely subjective, and what some runners might wear in certain conditions could be conceived as overkill by others. The Ultimate Direction Ultra Jacket V2 and Ultra Pant V2 is not a system I’d recommend for a misty, 50-degree-Fahrenheit, calm day. This kit is designed for keeping you warm during a middle-of-the-night bonk in a sleet storm on the side of a mountain when you can no longer run enough to generate heat. This is Oh Sh¡t Kit that you can zip up and tunnel vision your way through a really bad storm with during an ultramarathon or long adventure run. For runners who typically run a bit cold, this kit would be an excellent investment for you. But, if you’re a runner who tends to sweat profusely under layers and shows up to 20-degree-Fahrenheit winter runs in shorts and a long sleeve, then you’ll likely get overheated in this jacket-and-pant combination. I think the Ultra Jacket V2 works very well to layer under for very cold conditions in the winter when you don’t want the added weight of a heavier insulated jacket. Full disclosure, I dress like a complete wimp in cold conditions. While $310 is a lot to pay for a jacket-and-pant combo, I think they are so well made that it might be a one-and-done purchase. 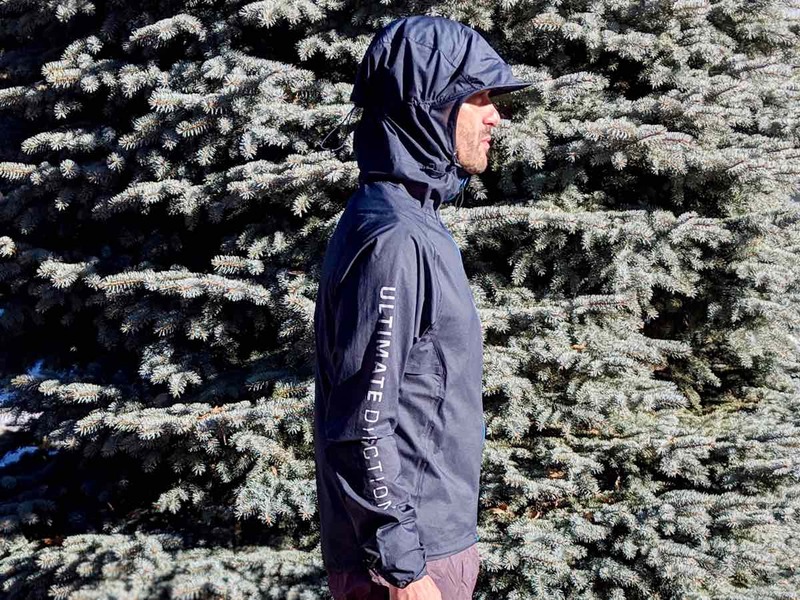 If you’ve ever had to drop from an ultramarathon due to not having the right clothes in inclement weather, consider an investment in the Ultimate Direction Ultra Jacket V2 and the Ultra Pant V2. Do you have the Ultra Jacket V2 and the Ultra Pant V2? If so, what are your overall impressions of them? How would you compare these pieces to other ultralight waterproof/breathable running kit out there? What do you think about the details and features of the jacket and pants? The hood, the mitts, the ankle zip, and more? If you’ve worn both the original and V2 versions, can you share your thoughts on the updates made to V2? Relevant text is copied below but the link also includes some nice illustrations. “Most rain shell fabrics use a 2, 2.5, and 3-layer designs; most of the layers are tightly-sandwiched. Whether 2, 2.5, or 3-layer fabrics are used, these designs share most of their construction qualities, and there is only a small difference on the inside-facing side of the garment. All three styles feature an outer shell fabric, commonly referred to as a face fabric which is coated with a chemical Durable Water Repellent (AKA: DWR, more on this below) finish to help keep the outer layer from absorbing water. The second, or middle layer is the actual waterproof layer, whether that be eVent, Gore-Tex, another proprietary membrane generally made of polyester or nylon, or a coated fabric. Universally, the waterproof layer gets placed beneath the outermost layer which is termed the face fabric layer. To be clear, you can not usually see the waterproof layer from the outside, and the third and innermost layer is where all of the differences lie. A 3-layer consturcion has an outer most “face fabric” treated with DWR a waterproof material in the middle (an ePTFE like Gore-Tex or other) and then a internal fabric whose primary purpose is to protect the waterproof layer. Three-layer fabrics feature an external DWR treated face-fabric, a waterproof breathable membrane in the middle (that could be any of the types listed above) and a super thin polyurethane (PU) film or another similar backing. This third layer’s goal is to keep sweat and oils from clogging the microscopic holes in the waterproof-breathable layer, which reduces breathability and may make the user feel wet from sweat (that they might think is coming from the outside). The advantage of three-layer fabrics is they are typically the most durable overall because of the innermost layer, which protects the pores in the waterproof membrane from clogging (at least for longer), thus maintaining better breathability between washings. The disadvantage is three-layer pieces are not always as breathable and are often heavier than many of their 2.5 layer counterparts. You can see the pattern that’s part of the .5 layer; it almost looks as if it has been painted or printed on. The goal of this layer is to protect the waterproof breathable layer from getting clogged with dirt and oils while being as light and as breathable as possible. Another goal is to not inhibit the other layers overall performance. Outer garments that feature a 2.5 layer construction look similar to those that feature a three-layer design (with the exception that they may feel slightly lighter and more subtle). Models that feature a 2.5 layer construction have the same outermost layer that has been treated with DWR, protecting the waterproof layer. Then, an exceptionally thin polyurethane laminate or other coating is placed on the inside to help protect this layer from sweat, grime, or other oils that could clog the pores. This layer is often “painted on,” which is why it’s considered a half layer (Yes, the painted on layer is the half-layer, even if it covers all of the inside surface area). 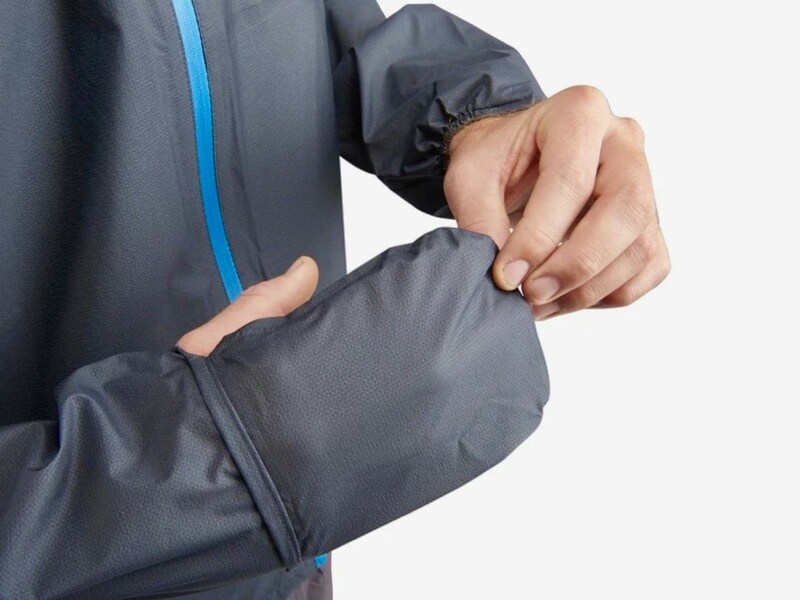 Jackets that feature a 2.5 layer construction offer similar breathability to 3-layer jackets, though depending on their liner they may occasionally feel marginally clammier. Why? Because the innermost layer doesn’t do quite as good of a job at “absorbing” and transferring sweat that has been created by the wearer. 2.5 layer jackets are typically slightly lighter and more subtle, but often not quite as durable (and must be cleaned more frequently to maintain breathability). It’s worth noting that in the last few years, we have seen the most improvement in 2.5 layer jackets to minimize their clammy feel in higher end models. These fabrics have the same DWR face fabric bonded to a waterproof-breathable layer, with a loose liner hanging on the inside that typically meshes; this works to help protect the membrane or coated material. These jackets are less expensive and more moderately priced. They breathe well but are heavier, bulkier, and not ideal for active outdoor users. Overall in the outdoor world, there are very few 2-layer models be made because of these disadvantages. However before the 2.5-layer revolution just over a decade ago, around half the rain shells on the market were 2-layer. Thanks for this. In reading OGL’s explanation it seems I didn’t fully understand the layering system. I will update after the holiday to be more clear. I appreciate it! Just to add to what Allen said: there are now new waterproof /breathable fabrics which get rid of the outer DWR layer entirely such as Gore-tex Active Shakedry and Columbia Outdry. So they are 2-layer jackets, but in a different sense to the ones mentioned above. I have been very impressed with my Shakedry jacket, problem is a can’t find decent waterproof pants to match. Pertex shell is not waterproof enough, Gore active running pants are horribly designed, and tons of fake “waterproof” pants which are just DWR-treated nylon shells. Honestly some of the XC ski pants are better than the running stuff. I now just use waterproof shorts and get wet from the knees down. Basically running in waterproof pants is not so practical like u mention, but more for extreme weather where u have to walk or get injured. I think mandatory lightweight stuff is a bit of a joke, i rather have something that actually works in an emergency. Tom, Happy Thanksgiving and thanks for your insightful gear review articles on irunfar! This layering nomenclature is confusing to a lot of people, but understanding it can really help make good gear choices when it matters the most. Tim – the shakedry and outdry pieces are probably best thought of as 1.5L jackets with the membrane on the outside and no face fabric, which eliminates the need for the DWR on the face fabric. The downside is there is no face fabric to protect the membrane, so durability may be an issue. Regarding the “fake waterproof” pants – a DWR treated nylon pant will never be waterproof, it’s just a wind pant. Patagonia Houdini pants for example. The UD pants described above are more like the OR helium pant or the Patagonia Alpine Houdini Pant (which may be discontinued but were technically waterproof). Nothing will keep you dry forever but having some type of waterproof membrane is much better than not having one, at least in prolonged cold/wet conditions when hypothermia may be a risk. I have had the Ultimate Direction Ultra Jacket V2 and Ultra Pant V2 for a year. We do not get a lot of snow in Oklahoma but I can tell you personally the combination kept me warm when the wind-chill was -13. Its surprising how warm these pieces are, which sounds like a gripe that some have about the jacket in particular during summer storms. I’ve been layering underneath this jacket for 20 F mornings, and it breathes better than other shells I’ve tried. I’d always rather be warm. I have this jacket from Dynafit. apparently it is 3L and only 199gms. What do you think of it? I really like it and keeps me warm but on very cold days I layer up with thin wind proof jacket underneath it.